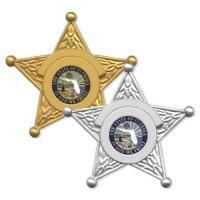 Blackinton B3098 Florida Custom Badge with Panel - B3098 - 2 3/4" x 2 3/4"
Home > Blackinton > Police Badges > Star Badges > B3098 Florida Custom Badge with Panel - B3098 - 2 3/4" x 2 3/4"
B3098 Florida Custom Badge with Panel - B3098 - 2 3/4" x 2 3/4"
This five point star badge from Blackinton features an embedded colored Florida state seal right in the design. The B3098 also has ball end tips for each point and an inner circular panel. The badge offers three panels for you to customize with lettering to suit your department's needs. Measuring at 2 3/4" by 2 3/4", this Florida badge is proudly made right here in the U.S.A. So you can count on durability and quality craftsmanship that will last for years. Please allow 4-6 weeks for delivery. Measures 2 3/4" x 2 3/4"
Florida Custom Badge with Panel - B3098 - 2 3/4" x 2 3/4"
Mini Eagle Badge - MIB2060 - 1" x 1 3/8"
Mini Circle Badge - MIB1957 - 1 1/4" x 1 3/8"
Mini Badge with Wings - MIB1480 - 1 3/8" x 1 1/2"
Mini Eagle Badge - MIB1342 - 7/8" x 1 1/4"
Mini Eagle Shield Badge - MIB1282 - 1 3/8" x 1 15/16"
Maltese Cross Badge - BH1886 - 1 3/4" x 1 3/4"
Maltese Cross Badge - B765 - 1 7/8" x 1 7/8"
Maltese Cross Badge - B500 - 1 3/4" x 1 3/4"
Maltese Cross FD Badge - B499-A - 1 11/16" x 1 11/16"
Maltese Cross Badge - B495 - 2 1/8" x 2 1/8"
©2002-2019 CopsPlus.com: Blackinton B3098 Florida Custom Badge with Panel - B3098 - 2 3/4" x 2 3/4"